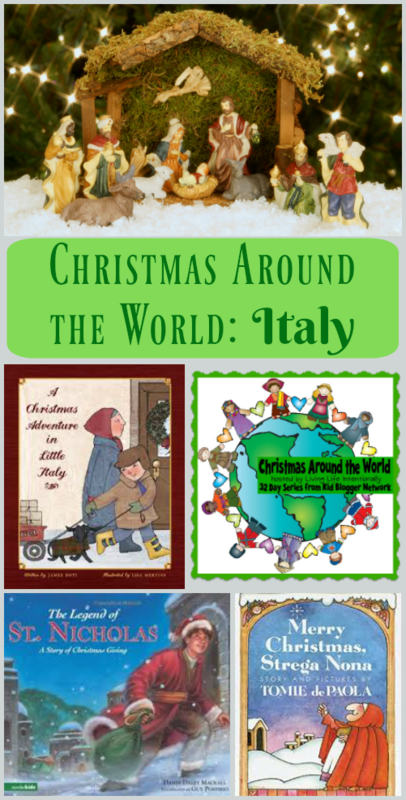 I'm so excited to be part of the "Christmas Around the World" series this holiday! I so enjoy hands-on activities that feature cultural traditions and geography like the Around the World in 30 Books activity. Today, we have 34 bloggers who are shaing some great information about the holidays in various countries. Our host blog, Beth at Living Life Intentionally, has done an AMAZING job of creating a FREE printable e-book for the kids so they can 'travel' to each country during the month. Please take a minute to print out the book or passport which has coloring sheets, fun facts and lots more! 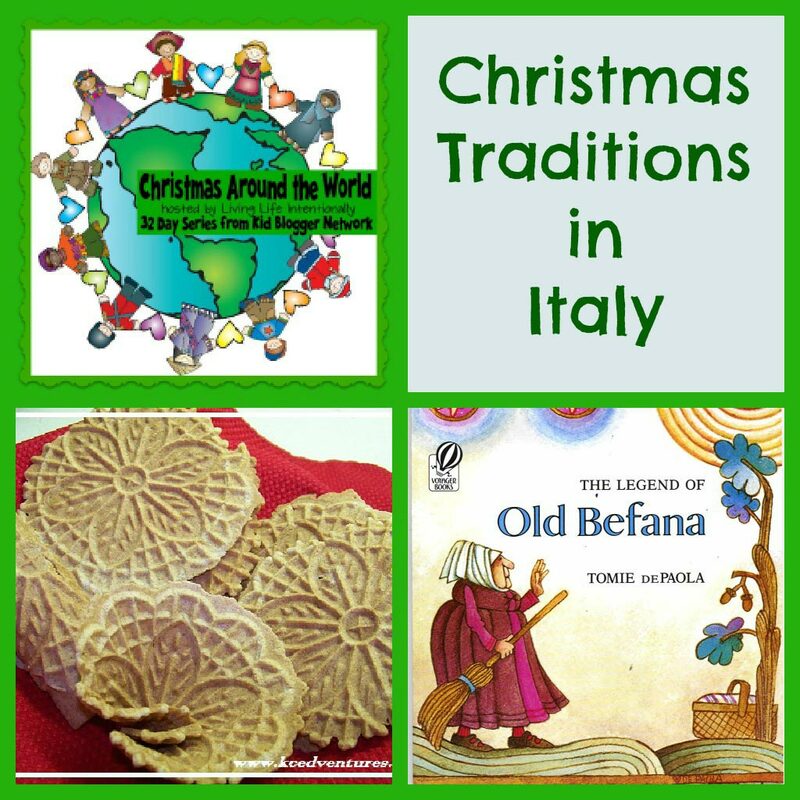 We're sharing popular Italian Christmas traditions that are perfect to incorporate into a Holidays around the World unit or as traditions for your own family. We're also including affiliate links for items that we've used in our home over the years. Part of my family's holiday customs originate from Italy. My grandmother's family lived near Sicily and they had some wonderful Christmas traditions that we still carry on today. I enjoy teaching my kids about why we do certain things around the holidays -- for example, our Christmas Eve meal is always one of my family's Italian dishes, like lasagne! As a child, we would also eat seafood on Christmas Eve which is another popular Italian tradition. One of our favorite family traditions is making pizzelle cookies - this has been done in my family for many generations. 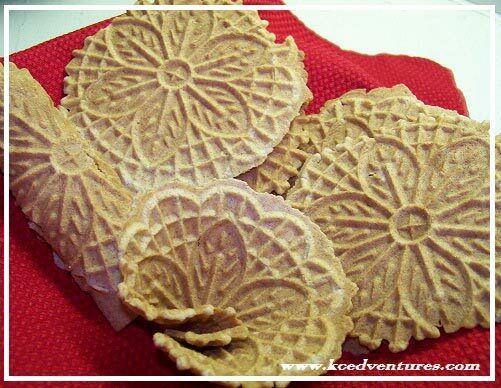 They are a beautiful, thin cookie with detailed designs and are cooked on a special appliance called a Pizzelle Press or Iron (they taste a little like a waffle cone). Some Italian families make biscotti or other special cookies at this time of the year too. As you can see, food is a very big part of the holiday celebration! Another family tradition we have is putting up our nativity each year -- nativity scenes are a very popular tradition in Italy. We include this as part of our 12 Days of Christmas Activities. Since our nativity set is breakable, we made sure to have a kid-friendly nativity set in the house each year so our children could set up the manger scene, walk the Wise Men to the stable and get hands-on with the Christmas story. If you're looking for a kid-friendly nativity scene, try this Wooden Christmas Nativity set or this fun buildable PLAYMOBIL Nativity Stable with Manger Play Set . We also always attend a candle-light church service at night on Christmas Eve. I've loved doing this and so do our kids -- there's something so peaceful about celebrating the holiday by candlelight. To replicate this at home, take a few minutes to turn down all the lights and allow just a small amount of light in the room (maybe the tree lights, flameless candles or flashlights). Spend a few minutes singing a carol or two -- Silent Night is a great one for this activity -- and just enjoying a quiet moment together. 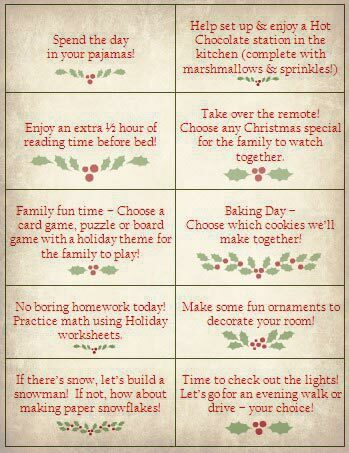 Here are more ideas for ways to slow down and enjoy the holidays together. One of the best ways that I've found to introduce kids to customs and traditions from various countries is by reading stories. In Italy, there are a number of celebrations during the Christmas Season, and there are some great children's books that highlight these celebrations. Read along as Jimmy celebrates Christmas Eve with Nonna (his Italian grandmother) and his dog Blackie. The story is set in the 1950's and reminds us of some of the simple ways to celebrate the holiday. Author Tomie dePaola, who was highlighted last month in our Online Book Club for Kids, writes some wonderful stories based on Italian legends. Merry Christmas, Strega Nona In Merry Christmas, Strega Nona, they are getting ready for the big Christmas Eve feast and the joy of being with friends during the holiday is highlighted. This day honors St. Nicholas, who was the patron saint of shepards. Some towns light fires outside to honor the shepards who kepts watch at night. In some areas of the country, gifts are left for children by St. Nicholas (in honor of the original story when St. Nicholas left a bag of gold for a soon-to-be-bride whose family could not afford her dowry). It's also said that children are allowed to choose their favorite meal on this day in honor of the feast. It's difficult to find a good story about the legend of St. Nicholas for young children but The Legend of St. Nicholas: A Story of Christmas Giving by Dandi Daley Mackall is close. The story tells of the original St. Nicholas and why he began giving gifts. Most importantly, it conveys to kids the true meaning of the holiday -- giving to others! Another day of celebration throughout Italy, the Epiphany commemorates the arrival of the Three Wise Men (or Magi). It often includes a special "King's Cake" which, according to tradition, has one bean baked into the cake. The person who finds the bean in their slice of cake rules the feast! One of the popular legends on this day is The Legend of Old Befana (otherwise known as the Christmas Witch). 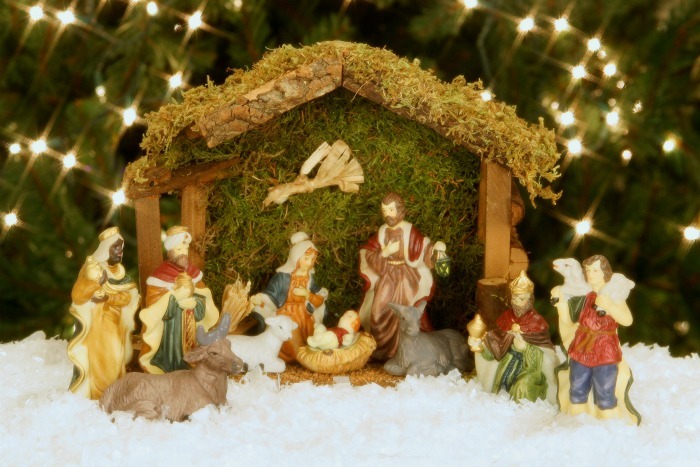 Legend says that the 3 Wise Men stopped at her home the night the baby Jesus was born to ask for directions. They invited her to come on the journey with them but La Befana told them she was too busy. When she saw a bright star in the sky later that night, La Befana decided to join them, but she got lost and never found the manger. Legend says that La Befana flies around on her broomstick on the eve of January 5th leaving gifts for children and hoping to find the Baby Jesus. In some regions of Italy, children still put out their stockings on January 5th for the gifts she brings them. 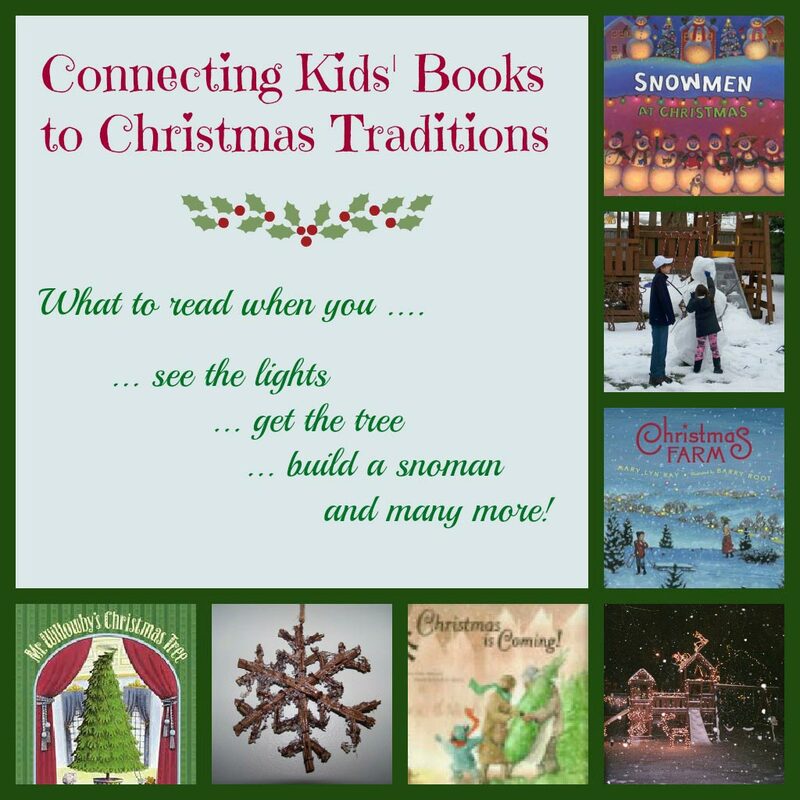 You'll also enjoy these 16 Favorite Christmas Traditions & Books for the holiday season too! For a modern look at how Christmas is celebrated in Italy, visit Christmas Made in Italy at Angeliquefelix.com! Thanks for sharing in Christmas Around the World - so glad you joined us! LOVE this! My Grandma makes those same cookies -they are my FAVORITES!!! I can't wait to check out the books you suggested too =-) Thanks for sharing in Christmas Around the World - so glad you joined us! I love pizzelles! Have been lucky that our local Aldi has been carrying 2-3 different flavors like caramel, chocolate, and vanilla! Loved finding out they were from Italy and the books were a great addition to your post about Italy. Thank you for sharing! Thank you so much! My relatives have been there but I haven't (so far). So, I really enjoyed learning about your traditions. STREGA NONA and some of the other books were very popular in my first grade classroom! I'm looking for a place where I can request a Christmas card from different countries for a project I'm doing with my grand-daughter. Any suggestions would be appreciated.